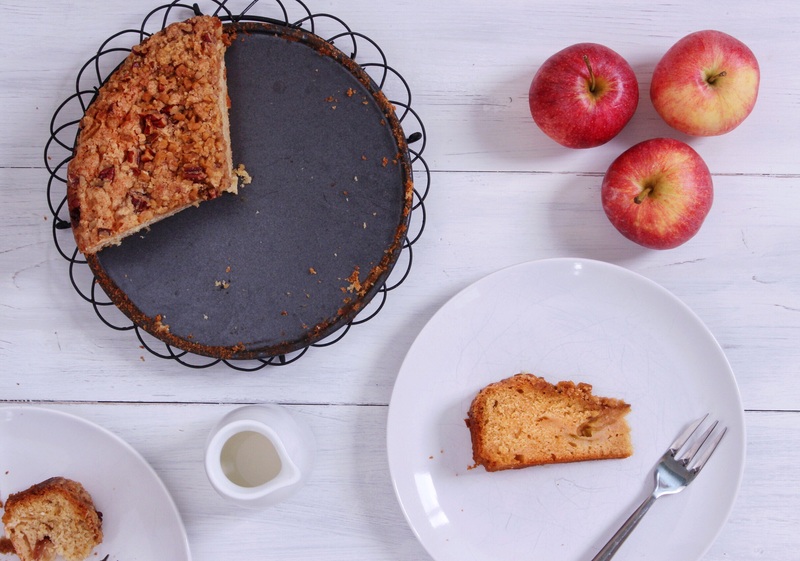 Autumn apple cake with maple pecan crumble | dash.drizzle.dollop.devour. Maple syrup is one of my quintessential autumn ingredients. It’s probably just the pictures of golden leaves on every bottle that’s created this connection, but when the leaves start to fall, I suddenly start drizzling maple syrup over fruit for breakfast, sloshing it into squash soups and adorning cakes with maple cream cheese icings. Whilst I was in Vancouver earlier this year I duly stocked up on all things maple syrup. My suitcase arrived home with a stash of maple syrup crystals, maple butter and maples candies, all of which have been patiently sitting in my cupboard awaiting their moment in the limelight. I almost feel like I must apologise in advance for this recipe, I know how annoying it is to come across specialist ingredients in a recipe. But I think with a little substitution here and a little google there, you can probably get away without a trip to Canada. This is a lovely moist apple cake topped with a crunchy pecan crumble. It’s a multi-tasking cake, one to serve up warm for pudding, with custard or ice cream, or as a stolen slice with a cup of tea in the afternoon. I decided to use both cooking apple and eating apples to add some different textures to the cake. So start by peeling and chopping one bramley apple and one eating apple into medium sized chunks. Melt a good knob of butter in a pan and sprinkle in a tablespoon of light brown sugar. Add the apples and cook over a medium heat for a few minutes until they start to soften. Leave to cool whilst you make the cake topping. The topping is a essentially just a very buttery, nutty crumble. Cube 50g cold butter and place in a small bowl with 30g plain flour and 50g light brown sugar. Rub the mixture together with your finger tips to form a rough, chunky crumble. It doesn’t need to be uniform. Chop a generous handful of pecan nuts into medium-sized pieces and stir through. Now, if you can get them, stir through 3tbsp of maple sugar crystals. Some of the brown sugar crystals that you can buy for coffee would also work very nicely. Otherwise, just add extra brown sugar. Set aside whilst you make the cake batter. Preheat the oven to 160C (fan oven). Place 100g soft butter and 150g light brown sugar in a mixing bowl and beat until light and fluffy. Then add 2 tbsp maple syrup and 2 eggs and beat again until combined. In a separate bowl, sift together 200g plain flour with 1tsp baking powder and a generous pinch of cinnamon. Stir half of the flour into the mixture, then add 50ml milk. Then add the remaining flour mix and another 50ml milk. You should have a nice soft batter. Finally stir through the apple pieces. Line the base of a 20cm round tin with greaseproof paper and then pour in the mixture. Sprinkle over the crumble topping and then bake for around an hour until the cake is golden brown and a skewer comes out clean when poked into the middle. This cake was perfect for pudding with my sister and brother in law (who even liked it despite not liking apples!) and my two beautiful nieces, so much so, that I didn’t have much left by the time I got round to photographing it! PS. I’m incredibly proud to announce that my recipes will be appearing on the menu at Alpine Adventure’s fantastic ski chalets in Morzine, France this year. You can check out their website here http://www.alpine-adventure.co.uk/ and maybe sample some of my cake at the end of a hard day skiing! The latest recipe from the lovely Anna. Can’t wait to try it out! I made the apple cake late this afternoon and we have just eaten it warm with ice cream. It was delicious and perfect at the end of such a wet and windy day. I didn’t have any maple sugar crystals so used demerara sugar instead. Congratulations Anna on the news that your recipes are to be on the menu at the ski chalets in Morzine – this cake would be just perfect!